The Sandy Hook Pilot Associations provide pilotage services to all foreign flag vessels and American vessels under register (regulated vessels) entering or departing the Port of New York/New Jersey, the Hudson River, the East River, Atlantic City, Jamaica Bay, and Long Island Sound as required by state law. Pilotage is provided on a 24-hour basis, 365 days of the year in all weather conditions and port circumstances. Pilot orders are normally placed by locally based ship agents/representatives who maintain established accounts with the Sandy Hook Pilots. Orders for arriving vessels must be placed no less the 24 hours prior to arrival at pilot station. Orders can be placed by telephoning our dispatch office 24 hours a day at 718-448-3900 Ext. 225. Orders cannot be accepted by email or other electronic means. Changes to arrival times must be received no later than 6 hours before scheduled arrival time. The Sandy Hook Pilots maintain a pilot vessel on station year round. Either the Pilot Boat New York or Pilot Boat New Jersey will be “On Station” and monitoring VHF channels 13, 16 and 73. Both vessels are equipped with AIS. Using a 53ft (16m) aluminum launch (America Class Boat), the pilot will be embarked from this vessel. The pilot launch carries the same lights as the pilot boats on station. 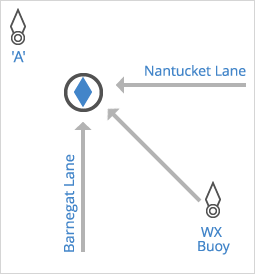 Vessels approaching the Ambrose Pilot Station from sea should confirm their arrival with the pilot boat a minimum of three hours advance notice. Please be ready to confirm the vessels length, draft and air draft. Vessels should make a second call to the pilot boat when they are one hour from the sea buoy. Pilot boarding side will be given at the time of the second call. Rigging of the ladder, along with embarking and disembarking of pilot, must be under the supervision of a licensed officer. The ladder must be made in one length and not consist of two lengths shackled or lashed together, and should be equipped with spreaders about 10 feet (3m) apart. The area of the deck where the pilot boards must be well lighted and must be clear of obstructions to ensure a safe passage for the pilot. Trailing lines or retrieving lines should not be attached to the lower ends of the ladder. Ladders must be rigged well clear of water and discharge outlets and at a place near midship. 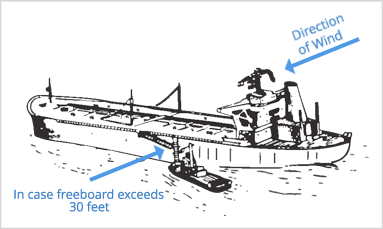 Vessels must comply with the new SOLAS Chapter V regulations. Rig the ladder 1.5 meters above the water. A heaving line must be available.